Congratulations! You have made a baby. Finally, the moment has arrived, you have been waiting for…!! As in the previous week, ovulation occurred. (Ovulation is a time when a mature egg/ovum is released from an ovary, pushed down via Fallopian tube and is available to be fertilized by meeting a sperm). Now your partner’s sperm will meet your ovum and the fertilization will occur. If this is successful then you are Pregnant! So, from this week on wards, your baby will start to form. You have conceived. The surprising fact is out of millions of sperms only one sperm can meet an egg/ovum. The meeting of sperm and ovum is necessary to fertilize further. Note: Once the sperm is able to fertilize an egg, Pregnancy starts. Within the hours of fertilization, a zygote, moves from Fallopian tube to a uterus. 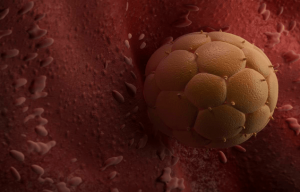 This zygote is now divided into 16 identical cells. These cells are somewhere yellowish in color and are known as Corpus Luteum. These cells will produce required pregnancy hormones which are progesterone and estrogen to support your pregnancy till more ten weeks, till the placenta is completely formed. Baby is like a Pinhead and to be termed as Blastocyst. The movement from Fallopian tube to the uterus can take six days, hence implantation starts from the 4th week. From here, the middle of the cell will become embryo and amniotic sac. The outer part of the cell mass will turn into placenta. Note: Please remember, the baby is a boy or girl, the whole thing depends upon the sperm of a male partner. If the sperm carries a ‘Y’ chromosome, then you will deliver a baby boy, but if the sperm carries an ‘X’ chromosome then you will give birth to baby girl. Change in the sense of smell – This is due to an increased level of estrogen. Therefore, a minute level of smell will appear to be a huge to your senses. This can be an early sign which indicates that your body is getting ready to carry a baby. This symptom will continue for few weeks followed by morning sickness. Change in taste – This may be due to the changing hormones in your body. This may continue till 24 weeks of pregnancy and hence sipping lemonade will help you to handle this change. 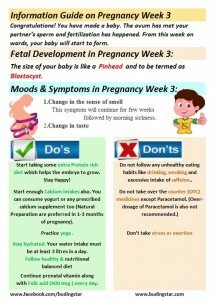 Once you have started noticing any visible symptoms or signs, start following some do’s and don’ts (important tips for Pregnancy week 3) so that you can cross implantation phase successfully. Start taking some extra Protein rich diet which helps the embryo to grow. Stay Happy To-be Mom! Do not take stress or exertion. Start enough Calcium intakes also. You can consume yogurt or any prescribed calcium supplement too (Natural Preparation are preferred in 1-3 months of pregnancy). Do not follow any unhealthy eating habits like drinking, smoking and excessive intake of caffeine. Follow healthy and nutritionally balanced diet. Stay hydrated. Your water intake must be at least 3 litres in a day. 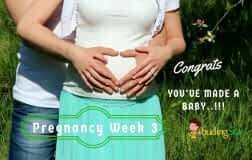 Remember, if you become successful in conceiving during this period, then it will take two weeks more to show you the positive pregnancy test result. Take very good care of yourself! You are blessed and pregnancy will be the most beautiful experience of your life. Live it wonderfully…! !